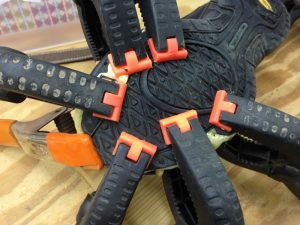 Are they, for you, like me, the clamps you love to hate? I never have figured out how to apply spring clamps to hold two pieces and not make one or both workpieces move. Besides that small conundrum, I think they’re great! I especially like to use them for holding things other than work. For example, I have a ceiling-mounted ShopVac Hangup attached to a ceiling- mounted cyclone separator. Its long, long hose will reach my worktable area easily. But, when I’m working further away, the hose wants to recoil. 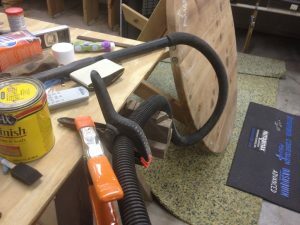 To keep it close, I hold it in place with a clamp big enough to allow the small-diameter hose to avoid restriction, which means it’s close by when I need some vacuum. A remote control allows me to turn it on and off right from where I’m working. A spring clamp to hold a spring clamp. Funny, but it works. It might take two hands to compress this big boy, but the space in the jaws allows the 1-1/4″ hose to stay in one place, yet still pass plenty of air. 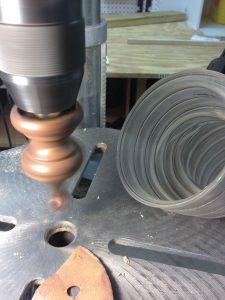 I also use spring clamps to hold a 4″ dust collector hose on the table of my drill press when I’m sanding. At high RPM, this technique can generate a lot of dust, and the high volume of the dust collector can catch it all. When I was salvaging these perfectly good Reeboks I glued the soles back onto the uppers with Gorilla Glue. These spring clamps were invaluable.